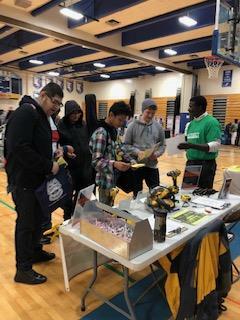 North Community High School hosted a Career and Tech Ed (CTE) career fair on December 12, 2018. Students in grades 11 and 12 participated in a career fair where over 20 professionals from the CTE industry set up booths for students to learn about in various CTE careers. Students also engaged with professionals from the CTE industries in a mock interview session. Small groups of students were paired with a professional, and they learned how to engage in an interview for a CTE related career.